If you are looking for my Donna Downey project it is HERE. Welcome to the February My Pink Stamper Blog Hop! You have made it to the end of the hop!! 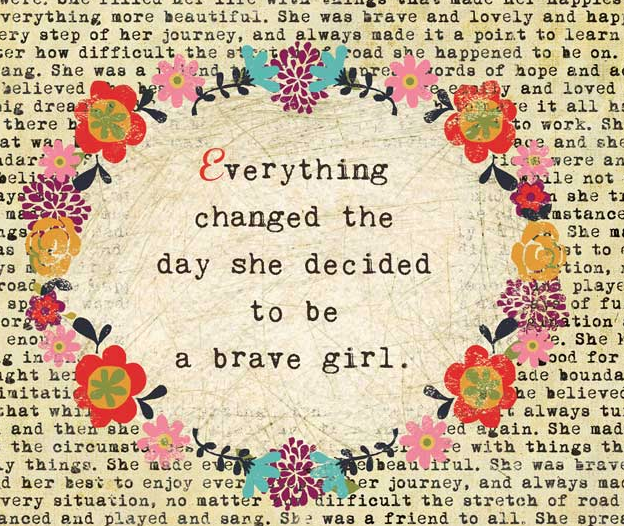 If you are on the right track you would have arrived from my super talented friend Tracy's Blog. If you are just visiting no worries, you can just follow the list below and start back at the beginning. Use the color red, a circle, a pink ribbon and MORE THAN ONE My Pink Stamper stamp. After you are done reading my post, please make sure you go back to My Pink Stamper and play along in the challenge with us! I hand cut a felt heart and did the blanket stitch around the edges. The rest, pretty easy :) I cut a rosette from the Ribbons and Rosettes Cricut Cartridge. To make the rosette since I didn't have my Gypsy to weld.....I cut 4 pieces at 1" and glued them together. I also used a border on Ribbons and Rosettes using Fit the Length (oh....the good old days) for the bottom of the card. 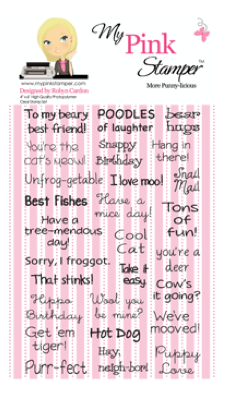 I used the My Pink Stamper Itty Bitty-licious (you can see it HERE) and (you can order it HERE). I used 4 different sayings from the set. YAY! More than one! You can also see that I used my pink ribbon, the color red and a circle--2 if you count the rosette. Challenge Complete! Before you leave.....want to win a My Pink Stamper Set of your very own??? All you have to do is leave me a comment below (hopefully about my project) by Monday, February 13th at 10 PM Central Time. I will pick the winner with random.org and post the winner on Tuesday, February 14th. You will have until Friday, February 17th to claim your prize. I love your felt heart. very pretty, and the papers are super. Great sentiments and thanks for the opportunity to win. Thanks for all your inspiration. I love how you used felt for that heart, I never never never think of stuff like that. It turned out great, thanks for sharing all your work with us! Super cute, Maria! I love the stitched heart! love the details and the different use of materials. I have gotten where i really like to see sewing on cards and pages. Been working with my embroidery machine to get it down on paper. Thank you so much for sharing with us love this. Your card is really cute! I love the stitching on the heart such great colors! The felt is a great touch and I really like the blanket stitch as well. Thanks for sharing! The stitching was a cute touch! Super cute card! The bow gives it a nice touch. Thanks for the chance to win! You did a great card. I love how you stitched the hearts. it is awesome!! Very pretty card! I love the stitching around the felt heart! Pretty card! Love the stitching you did around the heart. So sorry to hear your Gypsy is in for repairs. That being said, I think you did a great job without it on your card. Love the felt heart idea. 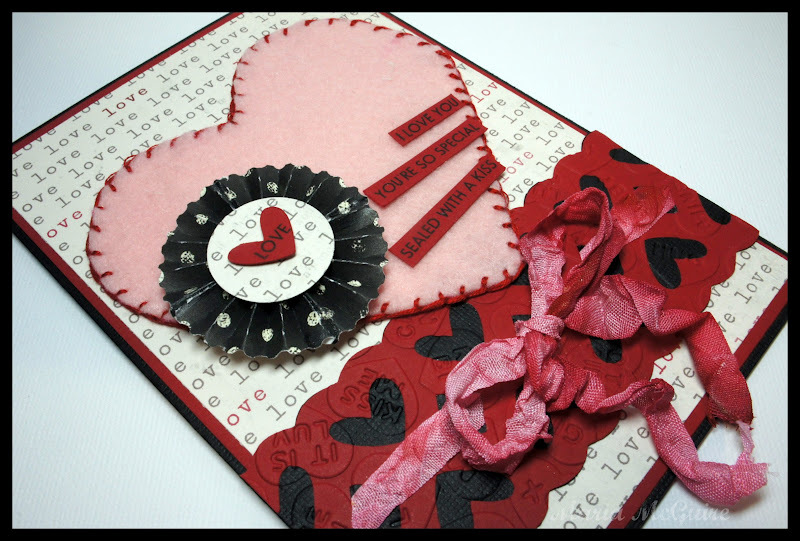 Wonderful homemade feeling to a very fun and wonderful Valentine's Day card. TFS and thanks for the chance to win. Hope there isn't a Gypsy bug going around. Despite your handicap you did an excellent job. Your felt heart is so sweet. The added detail of the rosetta completes the design. LOVE the stitching on the heart! Super cute, nice job! 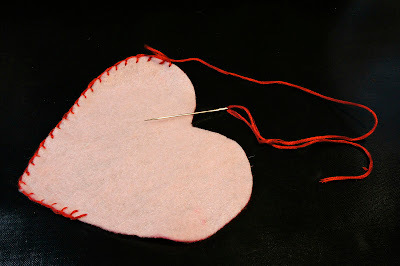 Love the way you added the blanket stitch to your heart. Very pretty card. I love your card, I thought it all came together great! you always have wonderful projects to share with all of us, thanks. Love the colors you chose for this project. Thanks Maria for sharing this and all your ideas with us. Great project!! It came out great, even without your Gypsy! :) Hope you get it back soon! I'd be lost without mine too! Thanks for the chance to win! Maria, I love how you made the heart out of felt. I need to try it out. Thanks for showing how. Thanks for the chance to win as I am a follower. I love it! I really like the use of the felt heart and rosette! Maria!! Awesome project!! Loved the sewing of the felt heart!! Really pretty card. I love the hand stitching on the heart. The felt heart is a neat idea. The stitching really makes it stand out. I really like the rosette. I've been wanting to try to make some, just haven't done it yet. Thanks for the inspiration. I love this card, especially the stitching around the heart. Thanks for sharing and for the giveaway! Your card is BEAUTIFUL!! I love the sewing around the edges. I'm have been showing my girls how to sew and they love the time together!! I will be showing they this card!! I love the felt heart! That is so creative. Stunning color combo. Very nice job TFS. Great job! Love your card. Thanks for another great hop! I love your heart card... the stitching really makes it! Thank you for the opportunity to win one of PS stamp sets ... You're the best! 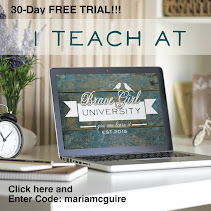 Thank you for the inspiration, I really enjoyed this blog hop (this is my second one I have ever entered). Beautiful card!!! I LOVE the felt heart - so pretty!!! I love the color combination on this card and the stitching on the heart. It is the little details that make it so special. The stitching around the heart is such a sweet touch. I love the whole card. Beautiful card! I love your use of different materials. Hope you get your gypsy back soon! I love the felt. It adds a little extra texture to the card! Love everything about your card, turned out beautiful! I love this card, especially the felt heart. What a great idea, thanks for sharing. I love the different types of materials you mixed on this card. I hadn't thought about using felt. Thanks! I love how you sewed your heart! It is sew pretty! I love the vintage feel of your card! It shows that you put a lot of time into it! And sorry about your Gypsy! I don't own one so wouldn't know how to work one. Maria, you did an amazing job without Gypsy. Your card turned out great. Love the Blanket stitch. Hope Gypsy gets better soon. Now I get to go have more fun and make something...yipppeeee! 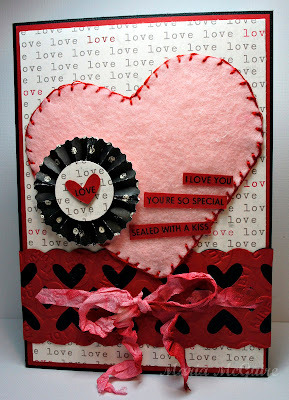 Lovely card--I really like the hand stitched heart! Very cute card! Great overall layout, I like everything on the card. Thanks for the chance to win a stamp set! I love the hear with the stitching. Love the card. Great job! great card. love all the texture. tfs. You did a great job, even without your gypsy! I love the stitching on the edge of the heart. I would never have though to do that. Your card is so so beautiful!!!! I love that you were so creative and imaginative without a gypsy even!! I feel your pain! Gluing instead of welding! Way to go!!! Maria, challenge is always a good thing. It stretches us to bigger and better things. A great project. Thanks for sharing. Your card is awsome!! Love all the details and dimensions!! Your card is really cute!!! Hope you get your gypsy back soon, but you did great without it!! I love your card! It has inspired me to get busy and make some Valentine's Day cards too. Thank you for the chance to win. I am totally in love with that card! Thanks for sharing! Thank you for the great project. I love how unique it was. Happy Valentines day to you! And thanks for the giveaway as well! I love your card. All the layers and design elements. Great card ~ I love the sewing aspect of it! I love the felt heart, cute touch to the card. I love the handmade feel and look of your card. thank all of you for inspiring the rest of us. want to win one of Robyn's stamp sets. Cute card! Thanks for the inspiration. Your card is so pretty. I like the blanket stitch around the heart. What a fantastic touch. TFS. And thanks for the chance. This is such a fun Valentine! Love all the great texture! I thought I was already a follower but somehow I wasn't... so I re-followed! Glad to be reconnected lol! Wow, I never thought about using felt on my cards. Thanks for the tip. I love this card. The textures are great! Thanks for the chance to win. Love the idea of using mixed medias! You are so creative! Im loving the felt heart with stitching. Actually, i love everything about the card. U did a great job. Love all the textures you used, it looks fabulous! Wishing you a speedy repair on your Gypsy!! What a great card. Love the colors and the layout. Thanks for sharing and the chance to win. Great idea for the heart! This is my first time following a hop all the way through, it was worth it! Thanks! The stitching is a great touch. the stitching ony our heart just makes it pop. I've been wanting to incorporate felt and have been drawing a crafters blank LOL. Your card has given me some inspiration and for that I Thank You. I am not sure I would know what to do without my Gypsy or the Cricut Craft Room...LOL! Love the dimension and look of your card! oh maria, this heart is gorgeous! MARIA!! I just saw this! LOve that cute lil hand stitched heart! Super cute card to!